The Eye of Shiva is opened in this card. When the Eye of Shiva is opened, The World is destroyed and we attain Enlightenment. According to the Kabbalah, it is on this, 27thpath, that we encounter Archangels in anthropomorphic guise. To encounter the Archangels as formless consciousness means to destroy another tower which we have created. After all, the winged figures we’ve grown up imagining are mere attempts of our minds to give form to that which is formless. One key symbol of The Tower is its very isolation. Unfortunately, most of us perceive ourselves as lonely towers – separated from the rest of the universe by physical and intellectual pursuits. The Tower shatters that perception to reveal our true source. It is not an easy realization – and often has to come through force and element of surprise – represented her by lightning flash. 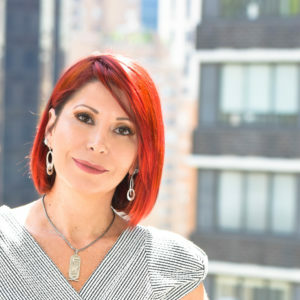 Astrologically, The Tower is ruled by the planet Mars, which corresponds with destructive energy of Gevurah – the 5th Sephira on the Tree of Life. Thus, the Tower points out that the inner growth is often a painful and overwhelming process. On top of The Tower are the serpent and the dove, representing the two forms of desire: the will to live and the will to die. These are also masculine and feminine impulses. The two figures falling from The Tower are the dual modes of the lower personal consciousness (consciousness and subconsciousness). Furthermore, the three large windows on The Tower invoke the Supernal Triangle, meaning that the activity of The Tower somehow involves our cosmic selves. To the sides of the Tower we see two representations of the Tree of Life. On the right is white on the left is black. White represents the Tree of Life. Black represents the Qlippot. Therefore, as The Tower is struck down, the opposites of ‘good’ and ‘evil’ are suddenly viewed differently. One begins to understand that all that IS in the Universe is part of the One Creator. Thus, every created thing contains the seeds of its opposite. It is a time of turmoil and destruction as you seek to understand how you could have been mistaken about a situation or person which you now have to come to terms with. Emotions like anger, grief, depression, and not being able to eat or sleep may be affecting you as our current sense of security has been lost or badly shaken up. We feel as if our comfortable world will never be the same. 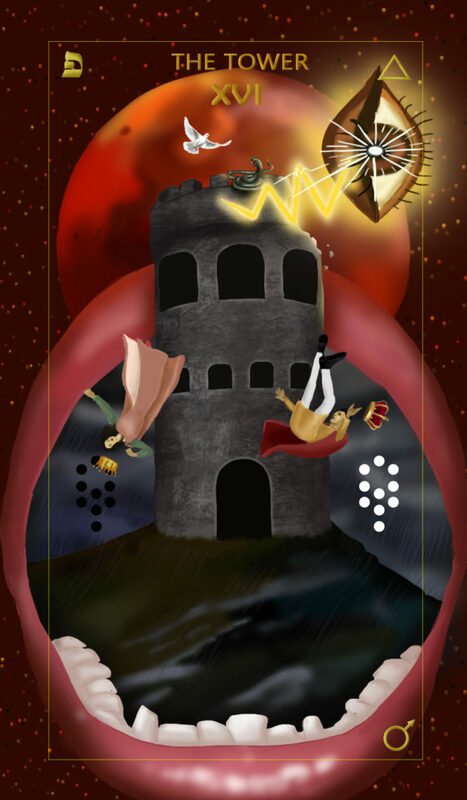 However the important message about the Tower Card is that with destruction of the Old comes the New and we can eventually look at life in a much more meaningful way which makes us wiser.